First we have is Tuna Tataki. it is sliced Tuna marinated and seared on a pan. It has beautiful presentation, nice red color of tuna, and it cooked well done. It also served with bunch of fresh veggies salad. This is absolutely recommended meal you should have. We also having edamame to be our starter. Nothing Special, but it is good choice while waiting other friends haven't arrived yet. 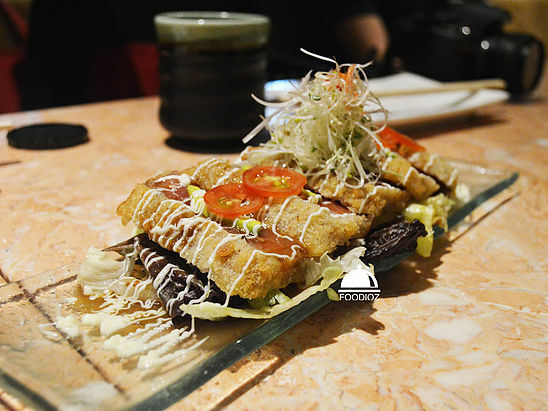 Another great starter to have is Wagyu Gyutansio Teppanyaki. 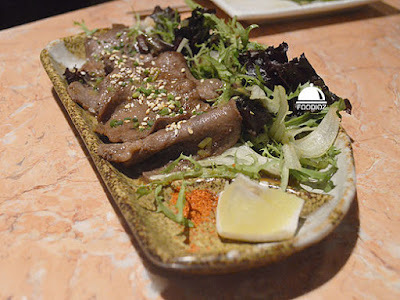 It is grilled ox-tongue in marinated sauce. Meat does have nice texture, it has been cooked well done but sauce is too sour i guess. It almost covered up the meat taste since it is strong. 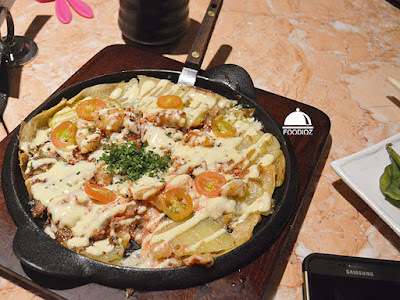 Next dish is Mentaiko Potato Cheese Pizza. It is hotplate of pizza slices with shrimp, mentaiko and potato also covered with mozzarella cheese. It is bit salty, it has nice texture and bites, pizza does have nice dough and little crunchy edge of it. 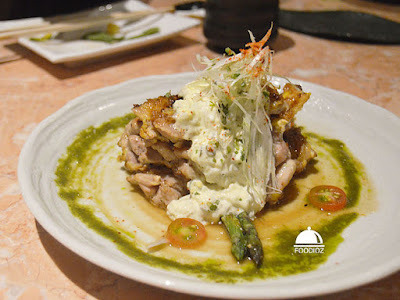 Next dish is Chicken Nanban. It has beautiful presentation, slices of cooked marinated chicken topped with Japanese tartar sauce. Not really fascinating taste, it is stir fried chicken, good texture but it taste too sour. 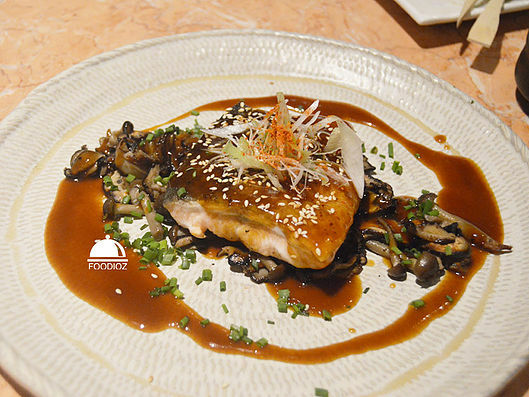 Then we have Salmon Teriyaki. 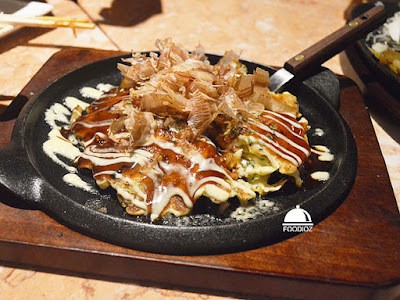 It is served with bunch of various mushroom, it also has sour taste as well. Salmon bit overcooked and it does not have any special taste of it. I think it would be better if short time cook for the salmon to put out the rich taste of it. Then we have Butterfish Misozuke. 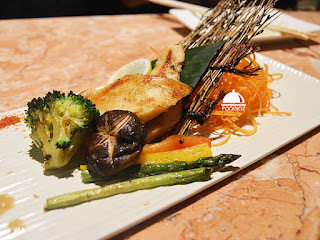 It is grilled marinated gindara fish, it has beautiful color, nice texture and taste good but it seems over decoration. Much of unnecessary ingredients are on plate while fish only 2 tiny slices. Next dish is Fujin Taki Udon Seafood. It is teppanyaki udon Fujin style, stir fried udon teppan style with bunch of seafood. It has nice plating, but it doesn''t have much flavor to describe, only salt taste. 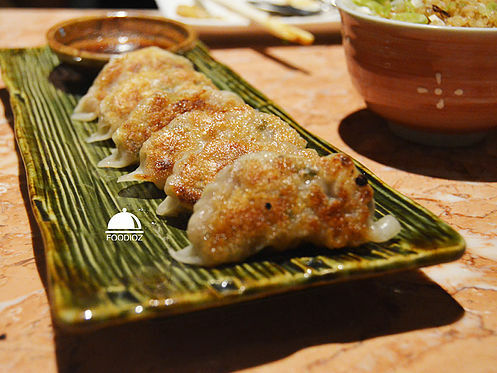 Next dish is Gyoza Pork. I am not recommended for this one, since it's oily and filling is not great when you found meat is not firm enough, i could taste it is rough minced meat and the skin is too sticky and oily. Then we have Avocado Salmon Tuna Tartar. 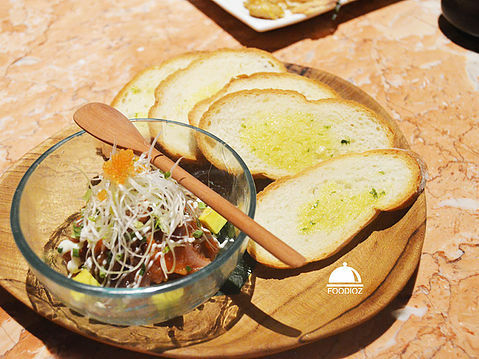 it is grilled garlic baquette with bowl of salmon & tuna tartar with avocado. It is fine, not fascinating though. It has nice concept but i do not taste any salmon and tuna it own taste. Next is Tiger Prawn Broccoli Mayo. It is grilled tiger prawn and broccoli with creamy mayo sauce. It has good bites, one sure not enough. 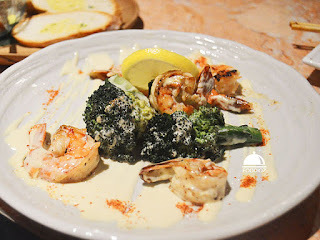 Prawn does have good texture, it is grilled well done also matched with the mayo sauce. After finished several main dish, we are having few kind of dessert. First, we have Macha Creme Brulee. 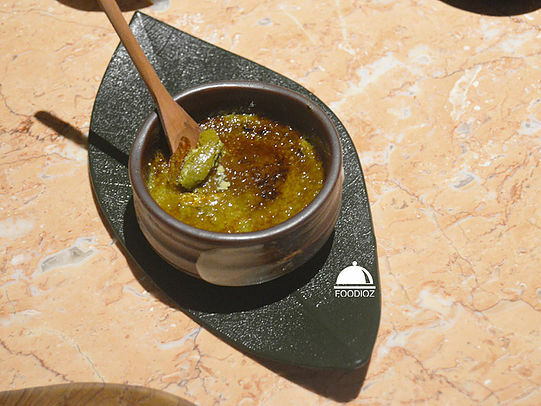 it is small bowl of green macha creme brulee, it has lovely flavor, strong green tea and it does have good texture, super rich. Then we have Cheesecake Cocktail. It is creamy cheese with orange liqueur mixed with berry sauce on top. It is rich, scrumptious and super moist. Also it has sour flavor by the orange, it is delicate. And don't forget, it is beautiful presentation too. Last dessert we have is Macha Ogura Shiratama. 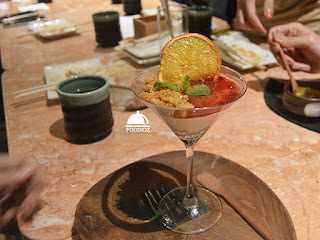 It is green tea ice cream with bunch of mochi balls, red bean paste and strawberry slice. It's typical green tea ice cream, not so strong at the creme brulee, mochi is plain, and red bean doesn't have any taste here since it covered up by the ice cream. 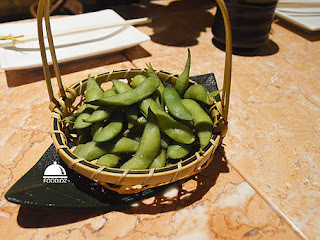 All over, this restaurant not so bad, some menu does not consistent, but i recommended some e.g tuna tataki, butterfish, or the prawn. it is good. For price, i guess this is normal around the Senopati area, as we know it's one of hits spot in town. Just they need to fix waiter service to be better, fast response especially when there's a lot of customers.